What is “Countering Violent Extremism”? 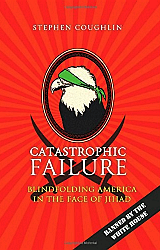 Major (ret) Stephen Coughlin is one of the foremost American authorities on Sharia law, and the author of Catastrophic Failure: Blindfolding America in the Face of Jihad , a comprehensive treatise on the subversion of our military, politics, and culture by the Muslim Brotherhood. In the following guest appearance on the Glazov Gang, Maj. Coughlin describes the origin and implementation of the “Countering Violent Extremism” (CVE) meme. For a brief period after 9-11, the phrase “Islamic terrorism” was heard in our national media, and was used publicly by President Bush and other political leaders. After being cautioned by his advisors that he might alienate “moderate Muslims”, Mr. Bush switched to the word “Islamism”, which was used to designate the “perverted ideology” of vicious people who had “hijacked a great religion”. “Countering Violent Extremism” has now developed into a domestic industry, with the Department of Homeland Security setting priorities on CVE, promoting outreach, launching initiatives, dispensing grants, establishing research programs, and doing all those other things that only a massive sclerotic nationwide bureaucracy can do. When you examine the details on CVE, you’ll find out that not only is it designed to shield Islam and Muslims from any undue scrutiny, it is also tailor-made to crack down on domestic “right-wing extremists”. The “behavioral indicators” listed to help DHS agents identify potential domestic terrorists include carrying around a copy of the Constitution, promoting First and Second Amendment rights, having a Gadsden flag sticker on one’s car, and advocating for a minimal federal government. CVE is thus designed to serve a dual purpose: (1) to protect Muslim Brotherhood organizations and their operatives who have penetrated federal, state, and local governments, and (2) to help the Obama administration crack down on its real enemies, domestic conservatives who want to re-establish constitutional governance. This entry was posted in Civil Liberties, Counterjihad, Domestic terrorism, Enrichment, Holy War, Legal action, Media, OIC, OSCE, PC/MC, Politics, Sharia, USA by Baron Bodissey. Bookmark the permalink. “Kinetic activism” is too harsh. I sense the dog whistle of “ableism” with your privileged assumption that all humans have the freedom to move. I think Semtexism will work better as the focus can then appropriately be on an impersonal severing of chemical bonds. Religion just doesn’t enter in. Along similar lines, any reference to Christianity or Judaism as the root source of Western values–or at least many of them–has also been erased, thus leaving young people with no sense of depth in our culture. Just two weeks ago today, when the San Bernardino terror attack took place, I heard the responding police chief say, “By the grace of God, we were holding a mass-disaster drill just a little way down the street” by way of explanation for the quick, huge response to the 911 emergency calls. I was listening to a live stream of the news via a KCBS radio patch from KNX in Los Angeles (wasn’t feeling well that day, so listened to lots of news; felt much worse). I haven’t seen, either online or in the newspaper, or heard this snippet replayed, anywhere since it was first uttered. Evidently “by the grace of God” isn’t acceptable public speech, either. I’m glad ‘the grace of God’ still exists in that police chief’s lexicon…at least till they send him to re-education camp. When I was growing up, one radio station would start their noon broadcast with bells from a church – always a different one – and they would briefly talk about the history of that church, including the fact that it was built (as most European churches are) on grounds or ruins once sacred to Pagans of one type or another , Celtic, Nordic, Roman, Greek, etc. Even Catholic priests had, in the 70’s and 80’s no problem admitting that most Christian holidays and customs are actually Pagan with a few name changes here and there. Today, you’re a ‘Nazi’ if you as much as mention the name Odin, or a weirdo if you even know any of the Celtic deities. Anyone who has studied the history of the Christian church knows that about the origins of SOME churches. See Cordoba and the Visigoths… Many national saints’ days developed from earlier beliefs, but the Christian liturgical calendar grew directly out of Judaism: passover (Easter) the harvest feasts (the Resurrection), etc. It only gradually assumed a separate existence. When the old gods wear out, the new gods arise. We live in an interregnum period…and one of my relatives is a Wiccan…doesn’t know anything about her family’s Judeo-Christian roots bec her parents are atheists, but she loves her Wiccan faith. Try Mircea Eliade for a broad, deep understanding of the needs which sacred spaces and sacred time provide for the average person. His books are worth savoring: and, yes, he spoke in favor of anti-Semitism. I simply bracket that part of his story because the rest is worth exploring. Control the language and you control the thoughts it generates. My friend was a lawyer and he said that’s exactly what they do in court proceedings. Sometims they would go into chambers and discuss/argue what terms are to be used and not used before the jury. And the judge would allow/dsisallow the terms questioned.